I have been seeing sun tea pop up on pinterest a ton lately. I’ve heard about it, but never made it/tried it/really thought much of it before. One sunny day, I decided to see what all the fuss was about and decided to make some tea of my own. I took stock of what kind of tea we had in the house, and decided to make mint raspberry tea. A whole lot of sunshine! 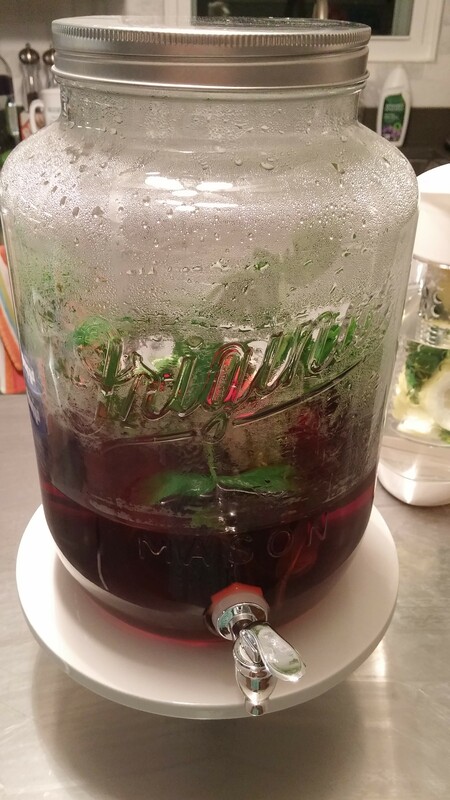 I started by getting out my big mason jar drink dispenser. I love that thing. I poured in the water. To make the tea bags easier to fish out at the end of this experiment, Dan suggested I tie them together. Good idea. A quick knot later, the bags went in the jar. At the last minute, and for good measure, I added in a few mint sprigs fresh from the garden. Now, just let Mother Nature do its thing. I left the jar outside in the sun for about 4-5 hours. When I went to retrieve it, I was surprised at how warm the jar was. There was even some condensation in the jar itself. That tea must have been steeping in hot water for a while. I added half a cup of sugar, stirred, and then added the second half cup. The tea was warm, so the sugar dissolved pretty easily. I wish I would have snapped a photo at this point, but I forgot until later in the day, when a good portion of the tea was gone. Believe it or not, there is still a whole pitcher’s worth of tea left in the jar. We’ve been drinking it all week. If I had time, I would have put the jar in the fridge for a while to cool. But, a bowl full of ice seemed to do the trick. Just put a ton of ice in a glass, pour in some tea, and you’re good to go. Honestly, this was one of the easiest things I’ve ever “made” from pinterest. And it was a complete pinterest success too! I’ll be making this refreshing tea again and again this summer.